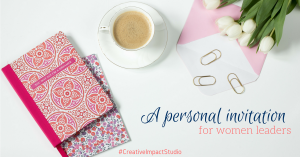 Get free access to all my training, resources and tools for women leaders when you join the Creative Impact Studio community. Membership in the Creative Impact Studio is free, but you must be invited. Get your personal invitation here and receive two free gifts. Access to the Resource Library and a free copy of the Creative Launch Reference Guide, my diagnostic tool which helps you move from idea to results quickly and easily. Get both when you accept my invitation to join the Creative Impact Studio.